Godot Engine - Our point'n'click framework is finally out! Our point'n'click framework is finally out! 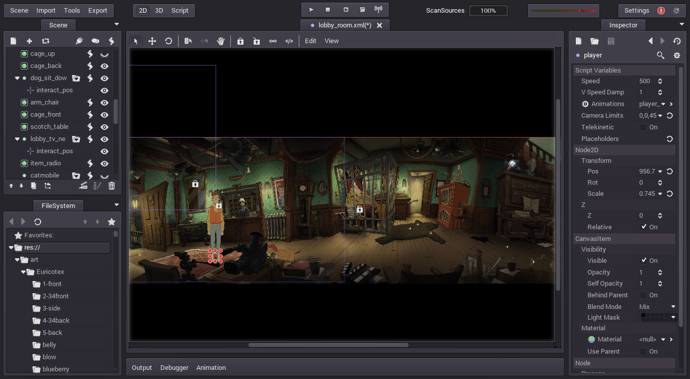 Escoria is a set of scripts, template scenes and a dialogue scripting language, which are meant to be used within Godot Engine to create classic graphic adventure games. It's not a "closed product", with its own UI and tools, and it's not a "make your game without programming" solution. It takes advantage of the Godot editor, and it's intended to be used by a team to make a game, with minimal intervention from the programmer. It is also intended to be "owned" by your team; you will take over the framework, and adapt it to the needs of your games. I will also try to do separate documents for any missing features, maybe videos demonstrating stuff if requested by the community. The basic package includes a test scene and some basic documentation, so check out the manual for a more in-depth coverage of all the features. Since we don't know how many people (if any :p) will be using this, we'll start by using the issue tracker on the GitHub page, and Godot's Q&A site using the tag escoria. 1 Juan Linietsky and Ariel Manzur, who participated in the development of the project.